I'm always looking for new ways to tempt Ellie's appetite. She isn't by any means a picky eater (yet! ), but I figure, the more things I can get her to eat now, the broader her palate later down the track. I also really appreciate recipes that I can make ahead of time and pull out of the freezer when needed. So with that in mind, I jumped right on these muffins, especially because they're so adaptable and you can add whatever you have to hand. Mix together all the ingredients. Add whatever veggies you have on hand. 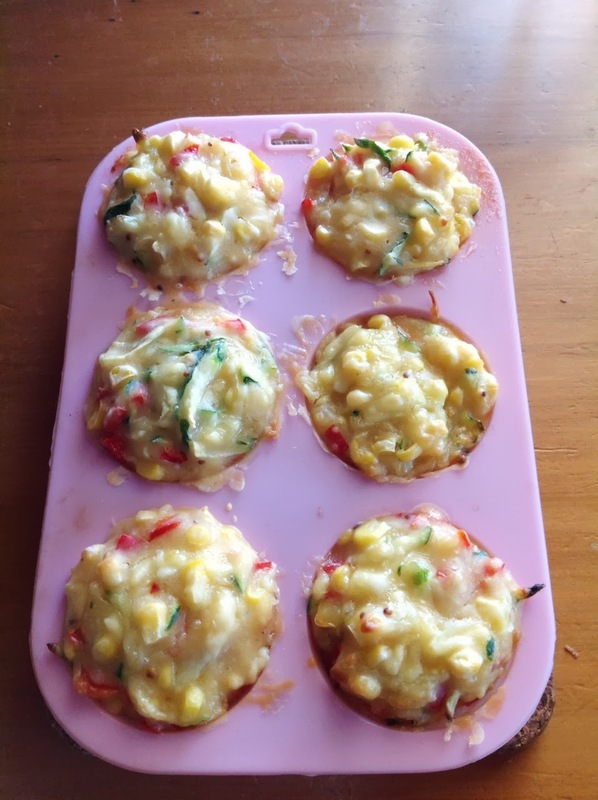 The ones I made recently had a small grated zucchini, a fresh corn cob and two small diced red capsicum. Depending on the veggies added, you may need to add extra flour or milk if the mixture is too wet/dry. Heap the mixture into your muffin tin. 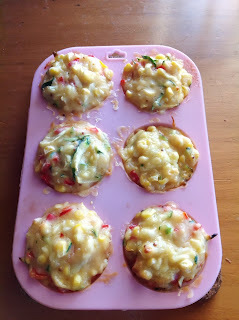 It will make 8 regular muffins or lot of mini muffins (perfect size for little fingers!). Bake at 180 for 25 minutes. I will add that if I was baking these for myself, I'd add more flavour, maybe some sauteed onion and/or some paprika and cumin. However since these are for Ellie (and her developing tastebuds! ), I leave the flavours a little more on the bland side, even leaving out the salt. Just quietly, they're a bit of a hit, and I cheer on the inside when she picks the vegetables out and eats them first. Do you have any recipes that are a hit with small eaters? Do you need to encourage your children to eat vegetables?